BTW, I'm still looking for inputs on the award for this campaign. Vote on one of the options I posted above, or submit your own ideas. Number 4 for the 'fruit salad' (ribbon). OFF TOPIC: Would post more photos, but a newly acquired puppy has stalled progress (actually 5 months old now). As soon as the CinC and I get the cute little chewing/biting machine to open her own doors to go 'potty', I'll jump back in the game!! Cheers, John. No rush--we don't kick off until May anyway. Mark, I have one that I finished for another campaign(Extreme Trucks). I am not happy with it, would this be allowed if I plan to make changes to it. Improve the exhaust system, add more details such as fuel tanks, decals etc. Sounds fine to me as long as you "completed" it more than six months ago. But I'm willing to fudge on the six month thing. The campaign this truck was in ended in Sept 2014. Is this still in. If so sign me up. This M113 was I think the second model I built after getting back into the hobby four years ago, and was intended as a test piece for trying oils for the first time. The mud was supposed to look like the bright red dirt so common in Vietnam, but it didn't look anything like that in the end. I mixed up a thin red brown mixture and shot it over the old pale colored mud, and then used an oil wash on top. The mud still looks pretty pale in the photo, and still not especially convincing, but I wanted to give it a try anyway. Not sure what's next for this campaign. Was this one suppose to start the beginning of this month?I didn't see any changes in the thread and it still says May 1st in the campaign page. 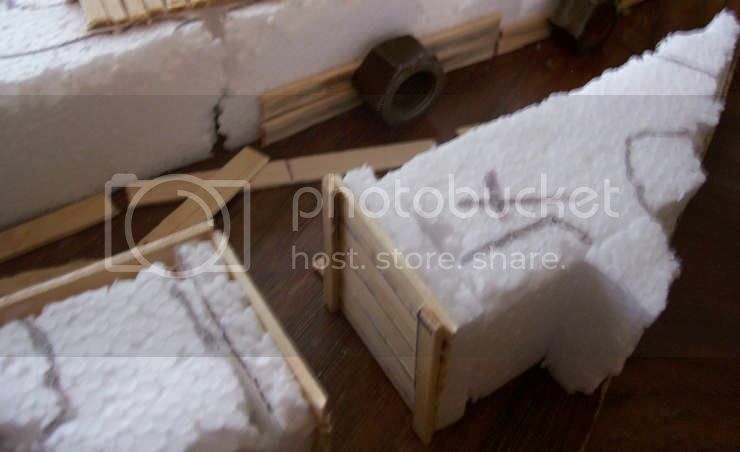 I'm still in with the revamping of my Great War trench scene. I'll begin probably later this month. Yep, Started the 1st of this month. Currently May 12th where I'm sitting. UPDATE: the little beast seems to have the potty training mastered. No 'accidents' in the house for over a week! As far as the armor goes: on my Spanish M47E2, I've modified the barrel for the 3rd time (someone needs to remind me how expensive this hobby can be). On the Somalian and Jordanian M47's: pretty much keep adding little trinkets here and there while painfully assembling aftermarket track links for both...T80's for the Jordanian and T84's for Somalian (or is it the other way around). 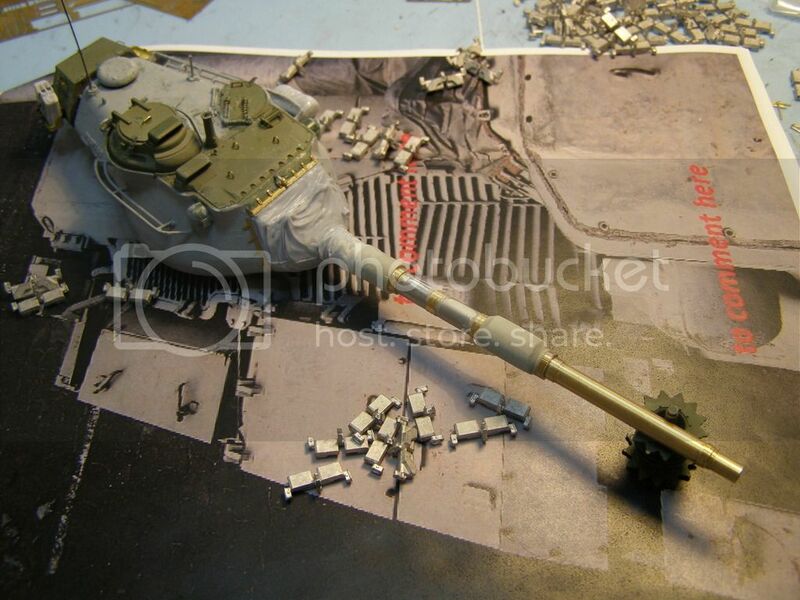 Oh well...its gonna take tons of time getting these little beauties re-done...especially the Spanish M47. Okay. The thread hasn't been "stickified" nor has a gallery been made. I didn't know if it had been delayed or maybe John had run off to join the circus or something. 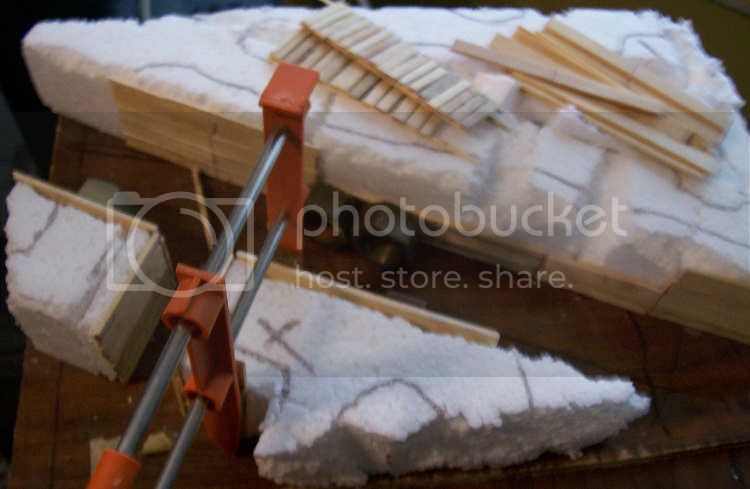 I may go ahead and start by the weekend with a starter pic and initial demolition and diorama breakdown. Not sure about "stickifiying" the thread, but I think posting photos in the forum should be fine. Believe I spoke with Nito74 about the need for a gallery for this campaign, but decided not necessary as long as we can see the before and after shots in the thread. No problem. I just wanted to make sure this thing had not been delayed or something. John must be out of town or something....everyone deserves a break. I'll go ahead and post some starter and progress pictures. I built this for the Great War Campaign last year. 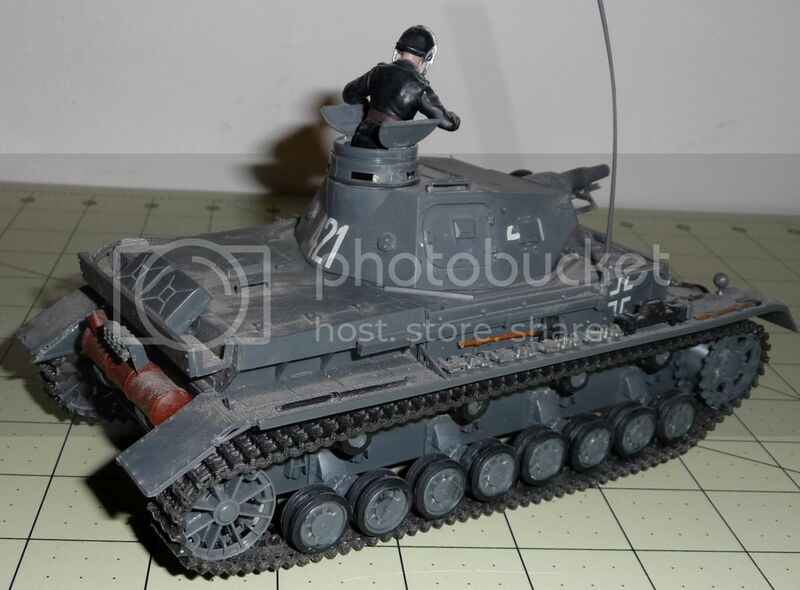 I used one of ICM's WW1 German figure sets and the old Alan FT-17. I enjoyed the build but really fell out of love with the diorama's layout and trench depth. That's what I mainly want to make-over here. Also, I want to add a few more Germans to the ranks. 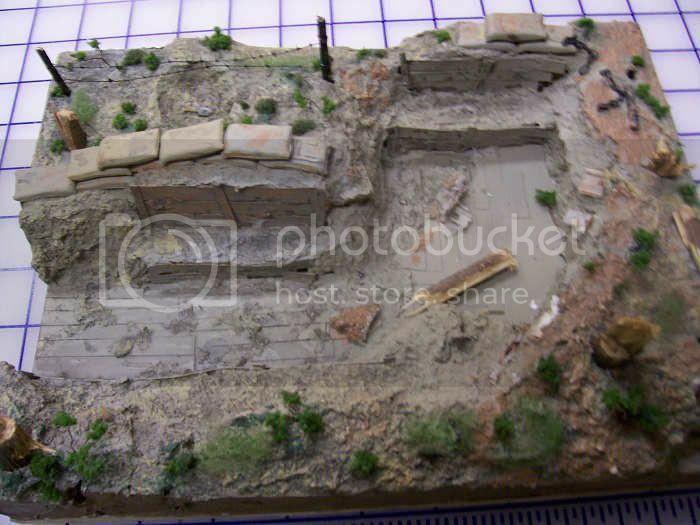 So here is the original diorama. More pictures of the original can be found in the Great War Campaign Thread and Gallery. ICM's 1/35 German Infantry (1914) figure set. I figure I'll add these to the mix. 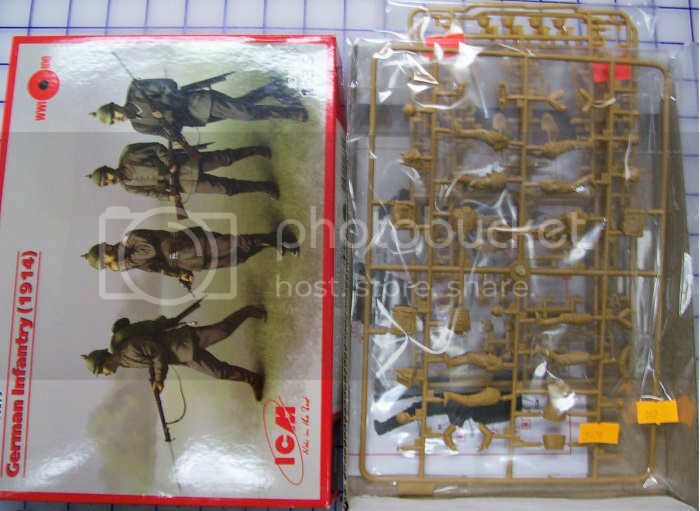 The set also comes with ICM's WW1 German Equipment set. I probably won't use the spiked helms, but I have plans for those in another project...think steampunk. Figures and FT-17 removed from base. I use white glue to secure them so they come off pretty easy. The empty base. I've actually come up with an idea for this so I might have a part 2 for this campaign. I'm thinking of added a bunker and making it a WW2 trench. I'll come up with something. That looks like a perfect project for this campaign. 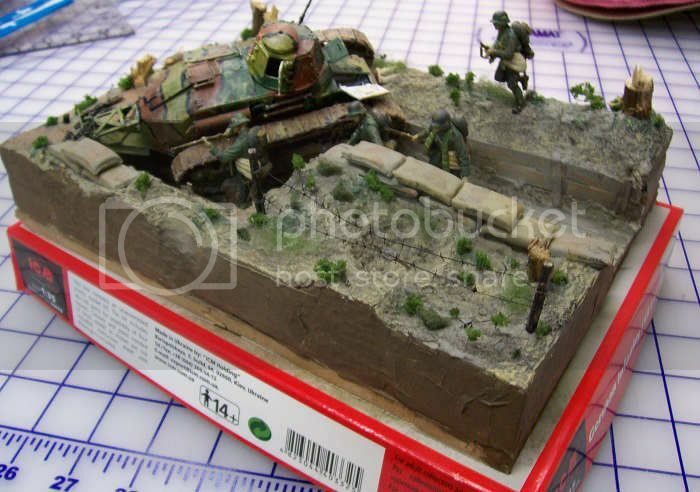 I really ought to have a serious go at diorama-making one of these days. 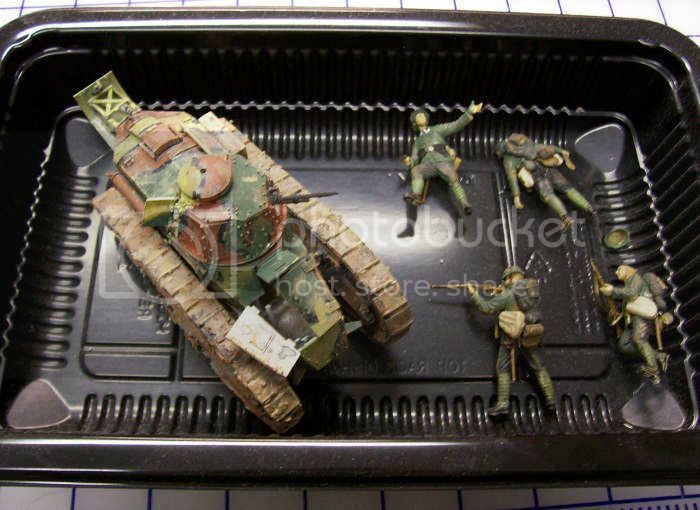 By the way, as long as you're tearing into that thing you might consider replacing those Tamiya sandbags (at least they look like the Tamiya ones) with some home-brew sandbags. They seem a bit perky--not enough sag for waterlogged beaten up sandbags. Just a thought. I really enjoyed building that one. It was my first WW1 subject. The trench's depth was the real issue. When I built it I didn't include the firing steps until later in the build. I just forgot them. I added them and was stuck with a shallow trench. The quick fix was a stack of Tamiya sandbags. The new base will be deeper and have an elbow for blast protection. The ICM set comes with their German Equipment set so there are a couple of MG08/15s and even a couple of antitank rifles. I might try to add a couple of MG posts. 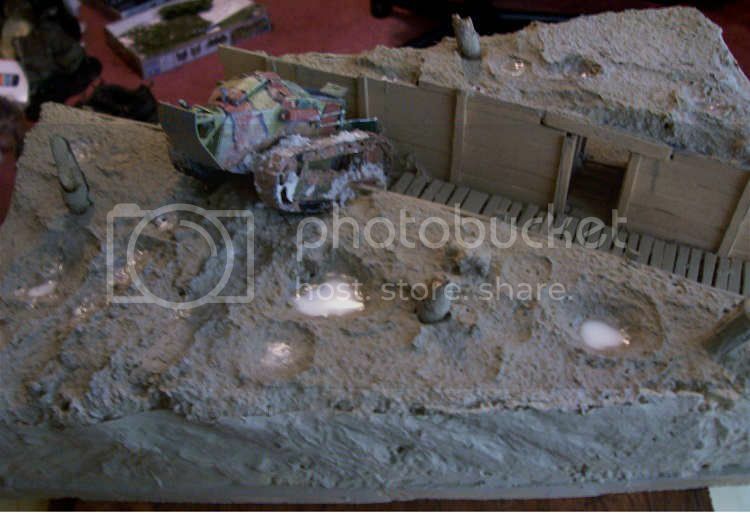 The tank will be posed like it had gotten stuck trying to cross the trench....or maybe knocked out right in front of the trench. As far as the old base, that's really a bit off before I really start looking at serious ideas. 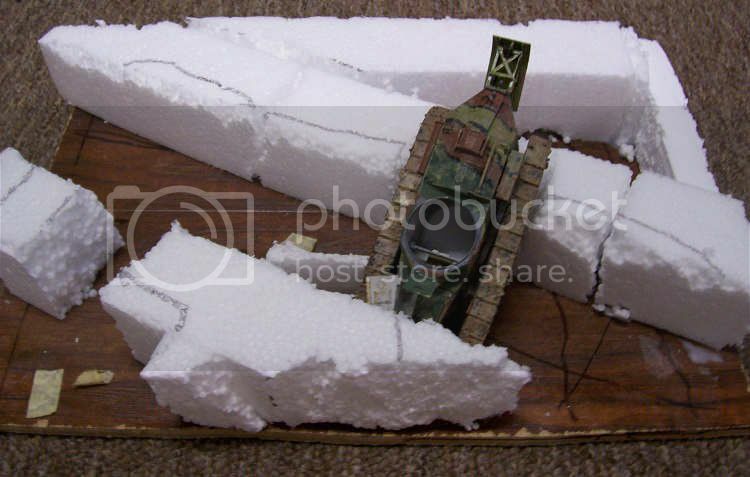 Given its size, there's not a lot of room for a AFV so it's probably a figure base. 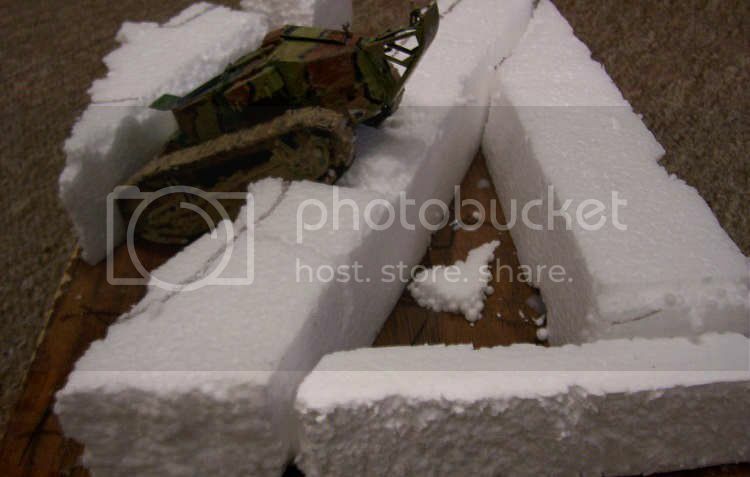 I was thinking a winter defense scene...with either German or Soviet troops. Maybe build a bunker for a MG or a mortar. Anyway, I'm finishing up my Argentine LVTP-7 for the Civil War/ Proxy Super Power War Campaign. Once I get that one done I should be good to go. maybe John had run off to join the circus or something. Thanks, John. Hope you're feeling better! I have a couple of projects planned for this campaign. The first one is going to be a simple one. 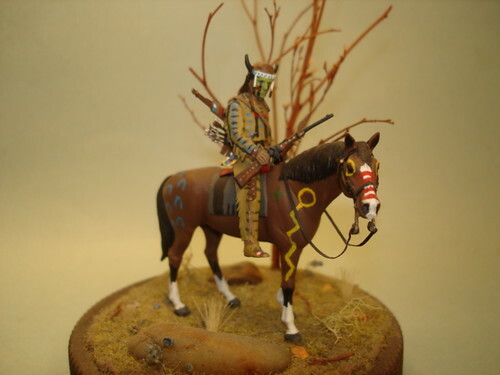 I want to fix the face and do different war paint on this figure that I built for the Saddle Breaking Campaign that ran from June 1st, 2012 to March 31st, 2013. I never liked the way it looked so I want to change it. I think that I might change the position of the rifle as well. I will have a couple of photos showing the change posted in a few days. 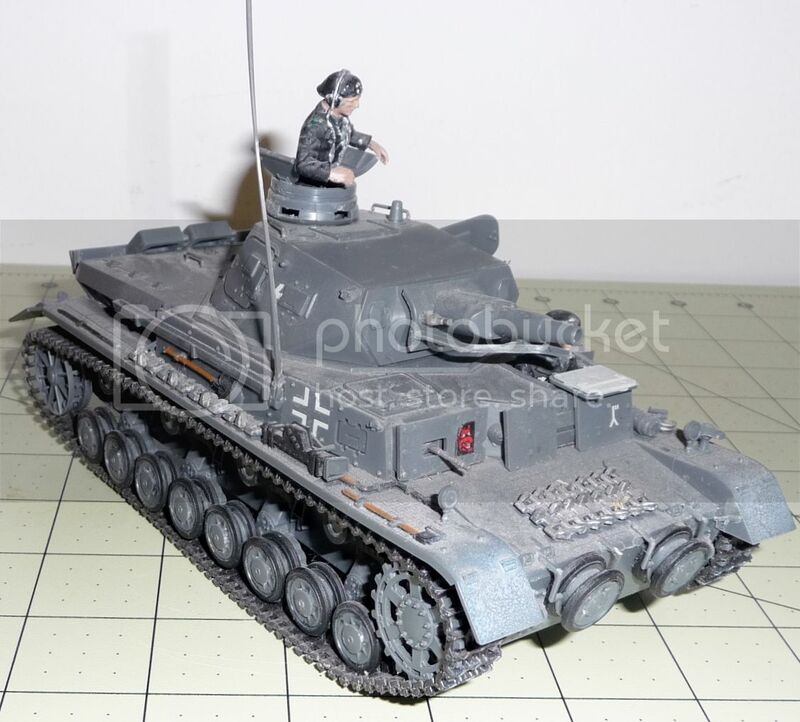 Been able to tinker a bit with at least one of my M-47's...mainly the Spanish version M47E2. 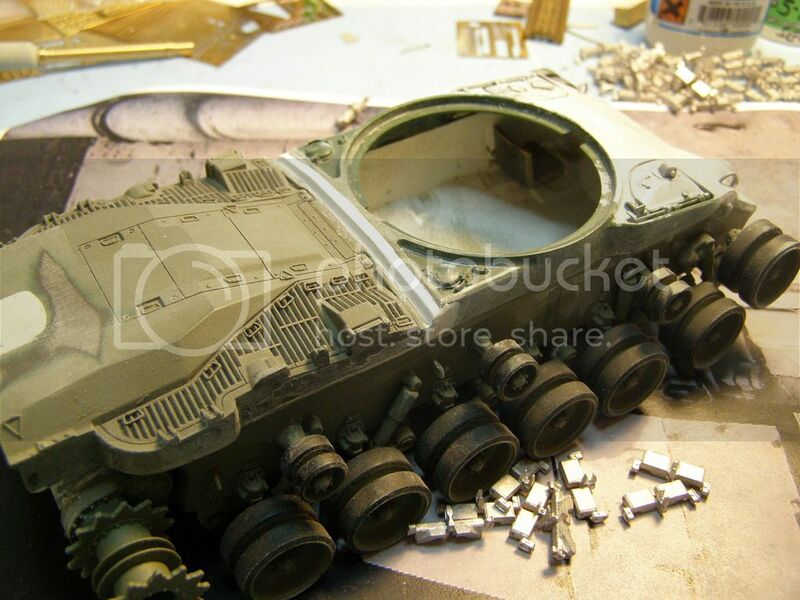 Finally blended/mated the M48A5 rear hull deck with the M-47 front hull...along with all the putty/filling of gaps. Awaiting a much more accurate rear engine grate from DEF (Korea). Will later install a good portion of Voyager's M-48 PE fenders. Securing the hull machine gun with a welded blanking plate, changing the lift rings a bit and adding the extractor to the right hand hatch...which was now converted to hold more ammo...and will eventually have a tube exiting over the right fender. 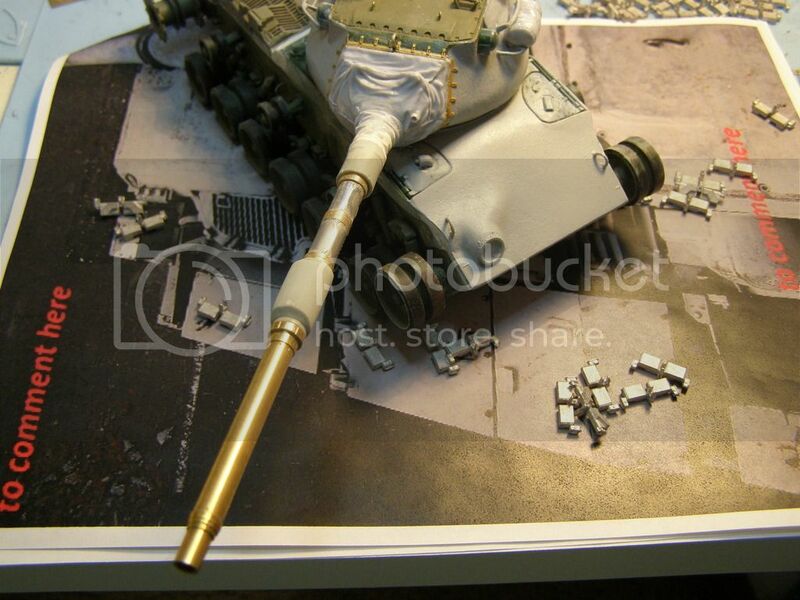 Modifying yet again the main 105mm gun. Its a crossbreed/upgrade from the L7A1 to being close to the M68 version of the 105. I added my own touch my combining parts of different guns and adding my own 'blankets' at the rear. 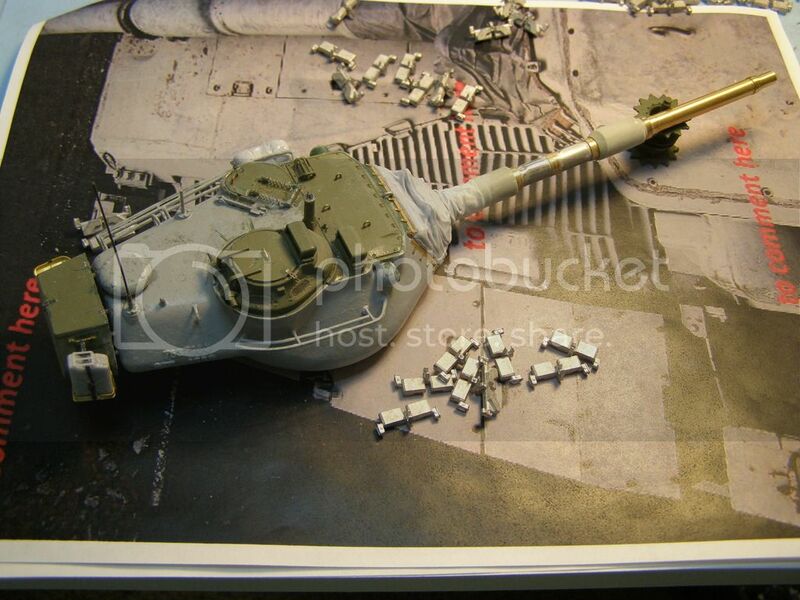 Taking a closer look, I've also added foundry markings/numbers to the right rear of the turret. As you can see I'm piecing together Friul tracks to install on this beast unless I change my mind again on whether it will be T80's or T84's. When I get time to tinker, I try and make the most of it! First off some of the ideas on renovating the old base. "A" I'll probably cut a trench section there. "B" I'll probably backfill the firing step. "C" will become an enclosed bunker or firing position for a pak or mortar. 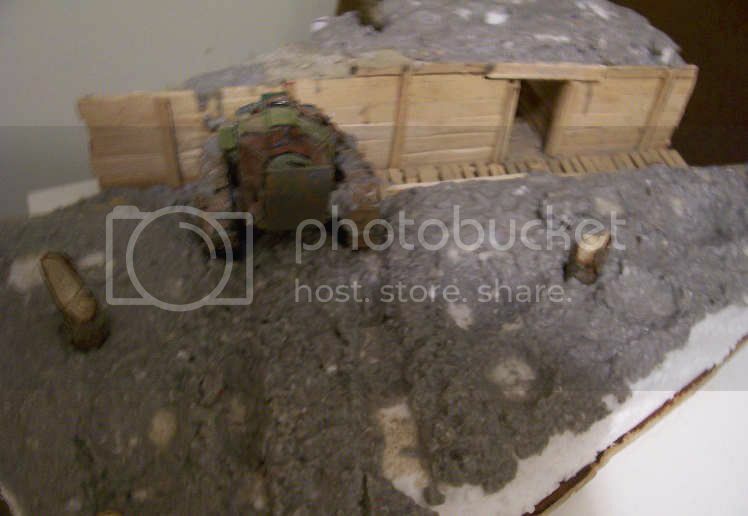 "D" redo the trench wall and make it more vertical. "E" remove sandbags and barbed wire. I'll probably go with a winter scene. But that's for later if I have time. 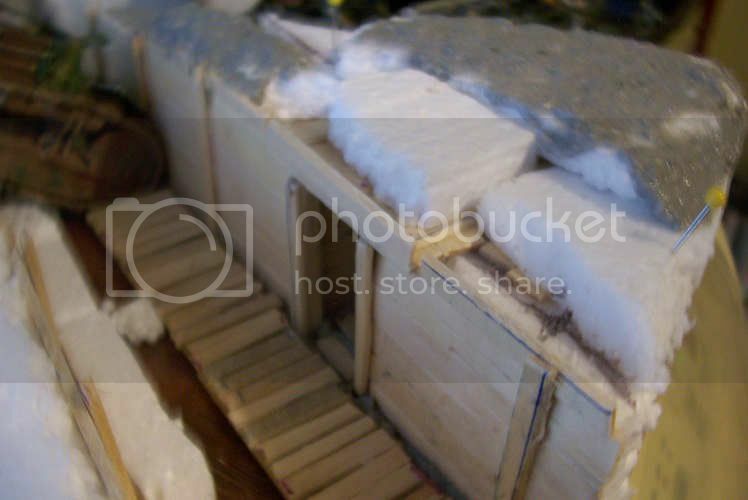 Time to start on the new WW1 Trench Scene. I used two sections of laminate flooring to make a base measuring about 22 x 34 cm. The flooring is light-weight and handles moisture really well without warping. 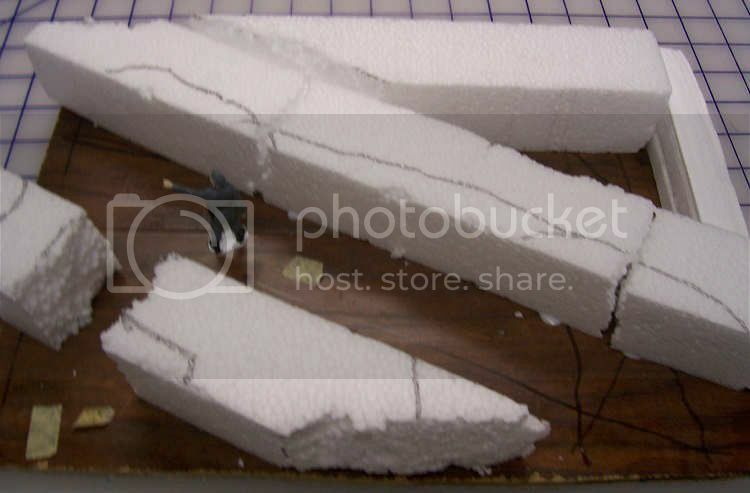 I used styrofoam to beginning the trench layout. There's a lot of trial and error, fitting and refitting. Once I got it sort of how I liked it, I locked it down with glue. The figure is for trying to get those dimensions down right. Took the FT17 and worked to get it placed. I decided to model it stuck in the trench. In its effort to back out it dug its self in deeper. Early on I decided to use roughed up outer edges. 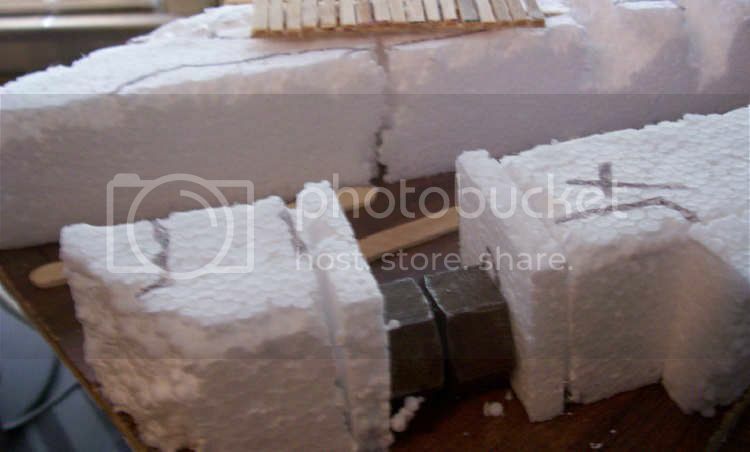 I'll coat these with white glue and tissue to keep it from shedding styrofoam bits. Quack-quack...duckwalk time. 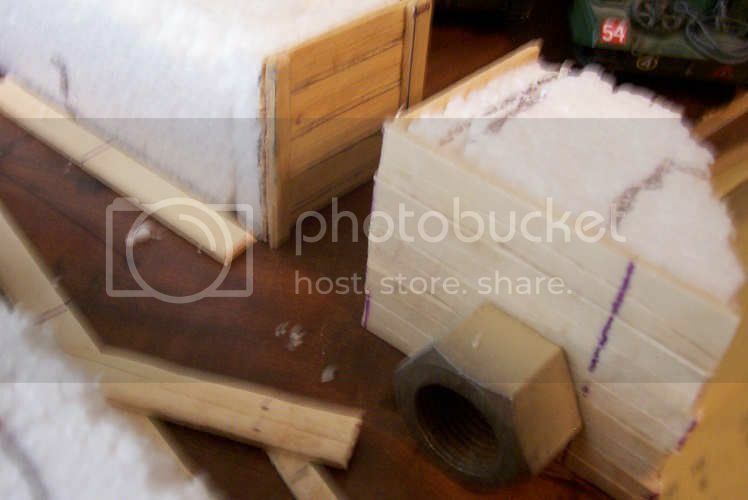 I used real wood for these...as well as the sides of the trench. I was planning to use wooden coffee stirrers. You can get these in bulk for a few dollars. 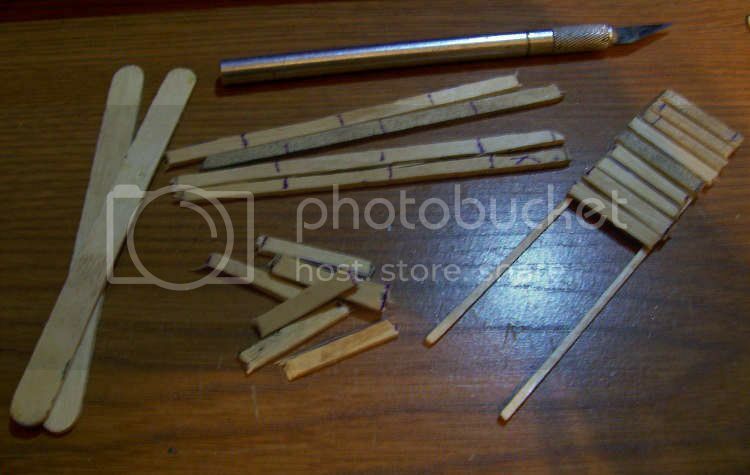 My stash was a bit sparse and I wanted to get started so I dipped into my stash of popsicle sticks. I split the sticks to make lengths about 1mm in height. 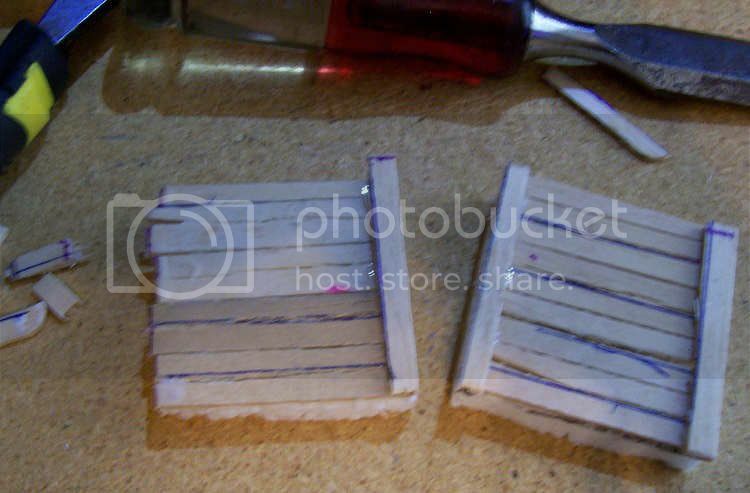 I rough then split a stick and rough cut them around 3cms in length for the walkway planks. I found using a chisel make quick work of cutting the pieces. I wanted a dug-out bunker. I left the opening larger than needed. I cut inserts to make the entrance narrower. The reason was so adding the side planks would be easier. I could add the to the inserts and then place the pieces in the now tight space. The purplish lines are where I'll be adding the vertical wood posts. Another shot of the bunker entrance. I started adding planking to the trench walls. Basically the same procedure as the entrance. More planking. I left off the planking where the FT17 was to be placed. I figure that when it fell in to the trench it would have pushed down and tore up the planks with its tracks. I'll address damaged planks later. 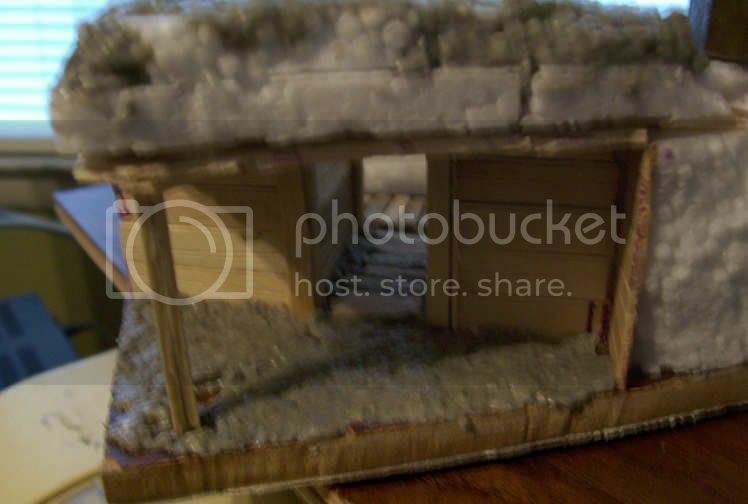 Not a good shot...but I made a planked roof for the bunker and glued it to a sheet of styrofoam I screwed up and had to cut in to the section above the entrance. I put it in upside down. I went ahead and used Celluclay for the bunker floor. I went back and forth on giving it a wooden floor. In the end I went dirt because that dirt and muck is one of the things I think about when I think of WW1 trench warfare. I also added more styrofoam to thicken up the layer of dirt above the bunker. Started adding Celluclay on top of the bunker. Also you see some of the duckboards loose-fitted to check the look. 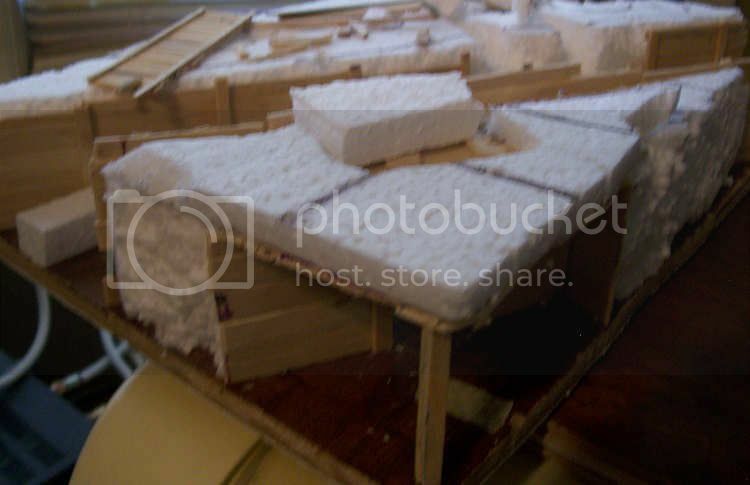 The pins were used to keep the bunker roof section in place while the glue dried. Celluclay layered on. 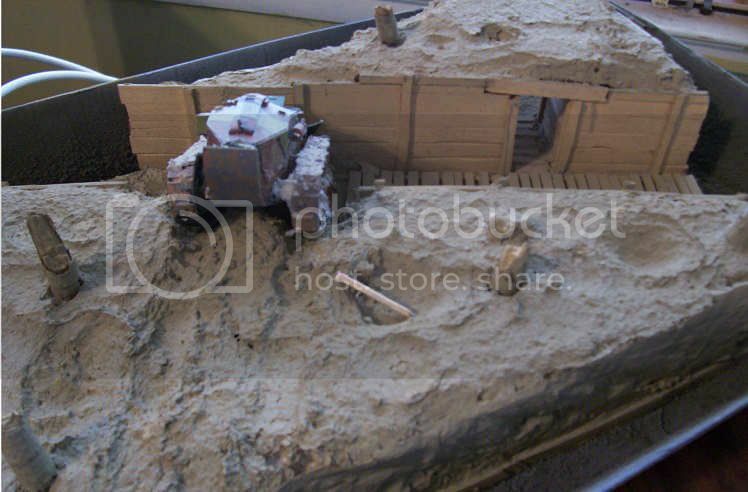 Tank added to work its track impressions. Craters added using m custom crater making tool...my finger. Smashed tree trunks came from bits of limbs from out in the yard. Added celluclay splatter to the tank to muddy it up a bit more. Celluclay dried and added a base coat of dark tan. I used a rattle can paint and you have to be careful because Rustoleum spraypaint will eat the styrofoam. Not shown, I covered the edges with tissue paper and white glue. They are painted dark tan but I'll probably repaint them another color to really set off that border. Attempted to add water to the craters. 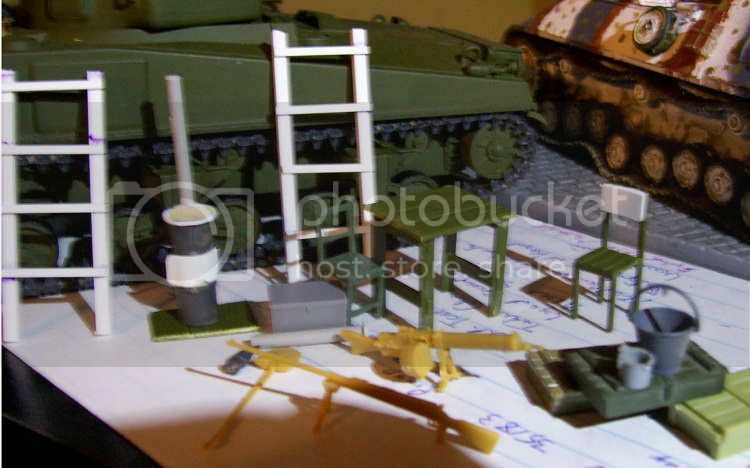 An assortment of bits I might use for the bunker and for the trench. Scratched two ladders from styrene strips. Scratchbuilt a wood/coal stove. Cut down a table from an old Esci set. Buckets, crates, lantern, and chairs. The machinegun is the MG08/15. The rifle is a Tankegwehhr M1918 antitank rifle. The shovel is a shovel. All three came from the German equipment set that ICm sends with its German Infantry 1914 Set (#35679). As an aside, the other German Infantry set does not come with the equipment set. Anyway, I'm not sure what all of this I will actually use. That's where I am at right now. Actually that's a lie. I worked on the firing steps earlier tonight and those will be in the next update. I'm really enjoying this build and I'm learning some stuff. 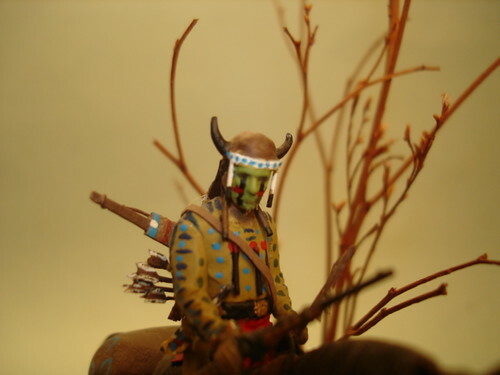 I plan on redoing and modding some of the figures from the old diorama and I'll start on the new figures as well. 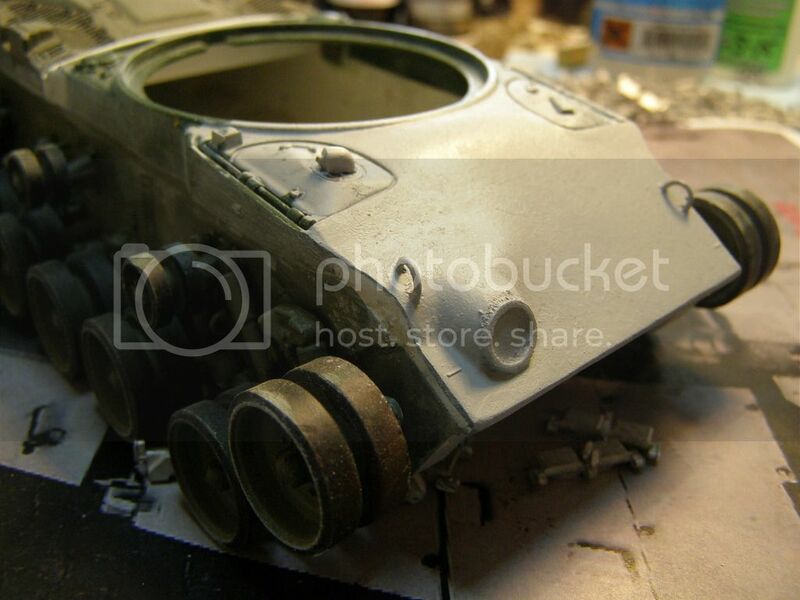 I'm thinking of trying to mod some additional figures to man the trench defenses, including the MG08/15. Very impressive effort there, John. That's going to look fantastic when it's done. Alex, really like how your dio is shaping up. Thanks Mark. I'm really enjoying the build. I'll probably start on the figures soon. I'm reworking some of the figures from the original dio and scratching a few additional ones to man the trench defenses. Thanx Mark...taking way too much time through, but then again, I always seem unable to leave a kit bone stock alone!